The choice of your domain name and its extension depends on various factors. Indeed, Domain Name registration is strictly regulated. The Filnet customer control panel allows you to manage and link your domain name to your web site, to emails and oher services in easy few steps. Included with your domain name : shared hosting for your web site and customized email adresses. 1Check the availability of the requested domain name. 2Select the ones you want. 4Once your domain name is registered, manage it easily from your FILNET customer panel. With Filnet solution, you can manage a few clicks your domain name and indicate useful parameters operation of services that you want to attach it. With Filnet solution, you can combine a few clicks your domain name to your web hosting. Domain name, what is it? Having a domain name allows you to customize your web presence. Your website can have the name of your company (eg www.my-company.com). Also your email addresses or your online services (online store, blog ...) can be customized. With which registrars Filnet works for domain names registration? Filnet is partner with the biggest French and European registrars to provide you with an offer that always fit your needs. How long to register my domain name? The main element affecting the duration of the implementation of your domain name is administrative procedures, which depend in particular selected extensions. If all the elements are gathered from the order, your domain name will be available in few minutes. Your commitment for a domain name is linked to the possibilities offered by the registrar, depending on the selected extensions. In general, the minimum duration is one year. I already have a domain name registered elsewhere. How to transfer to Filnet? Simply place an order by selecting "Transfer my domain." However, transfers of domain names are strictly regulated. You must check with your current registrar that you have permission to perform the transfer. In general you need : to unlock the domain name, to find the "transfer key" and to have access to emails send to the registrant adresse email. I have also other Filnet hosted services. 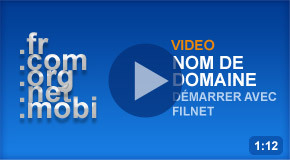 If I take my domain name with Filnet, how to manage the association with my services? You have full autonomy in setting up and managing your domain name. You can for example link your address like www.my-company.com to your hosted website. The technical and human resources implemented by FILNET guarantee an availability rate over 99.9%. I have both Filnet domain name and hosting services, how to link both? If you ordered two online services on Filnet site, from your customer panel, with few clicks you can automatically associate your domain name to your other Filnet services. You get a 24/7 email support on all of your access to Filnet services. Upon request, our engineers can also follow you on specific aspects of your practice. Domain Names Filnet.fr offer made ​​in France, administered and managed from Paris to follow and be in touch with quality. Domain Names are managed in accordance with procedures Filnet.fr, and teams, ISO 9001 certified. Domain Names are booked from infrastructure Filnet.fr that meets Green IT low energy consumption and environmental friendliness.